Sabrina Castro, an attractive woman with a strong New England heritage, is married to a wealthy, older California physician who no longer fulfils her dreams. An almost accidental misstep leads her down the slow descent of moral disintegration, until there is no place for her to go but up and out. How Sabrina comes to term with her life is the theme of this absorbing personal drama, played out against the background of an old Peninsula estate where her mother lives among her servants, her memories of Boston and her treasured family archives. 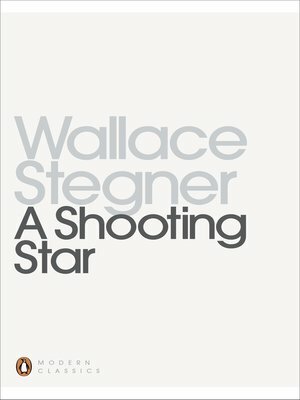 A Shooting star displays all the greatness of Wallace Stegner's storytelling powers. Wallace Stegner was the author of, among other works of fiction, Remembering Laughter (1973); The Big Rock Candy Mountain (1943); Joe Hill (1950); All the Little Live Things (1967, Commonwealth Club Gold Medal); Angle of Repose (1971, Pulitzer Prize); The Spectator Bird (1976, National Book Award); Recapitulation (1979); Crossing to Safety (1987); and Collected Stories (1990). His nonfiction includes Beyond the Hundredth Meridian (1954); Wolf Willow (1963); The Sound of Mountain Water (essays, 1969); The Uneasy Chair: A Biography of Bernard deVoto (1964); American Places (with Page Stegner, 1981); and Where the Bluebird Sings to the Lemonade Springs: Living and Writing in the West (1992). Three short stories have won O.Henry prizes, and in 1980 he received the Robert Kirsch Award from the Los Angeles Times for his lifetime literary achievements.